Tamer Union: According to Taomon's Profile, -next 0rder-'s World is Being "Distorted"
According to Taomon's Profile, -next 0rder-'s World is Being "Distorted"
October 30th, 2015. The official Digimon World -next 0rder- website has updated with an addition to its storyline section, as well as Taomon's profile. The Digimon was previously introduced in last month's issue of V Jump magazine, but this update adds a new piece of information; the sage has picked up on "someone distorting the principles" of the digital world. (Here 理 ri is used, which can refer to both logic and the underlying principles of the cosmos.) The digital world being "distorted" by an outside force is an old idea for the franchise, going back to Digimon World and Digimon Adventure. Direct translations are provided below. The new story section picks up where last month left off, covering the information from a previous issue of V Jump. Digimon World -next 0rder- will launch in Japan on the PlayStation Vita and PSTV in 2016. The game currently has no western release date. "What business have you, defeating me? Human." Although they have been Jijimon's close friend since time immemorial, at some point they departed the village. Pessimistic and unconcerned with others, they're quiet and have a stubborn personality. 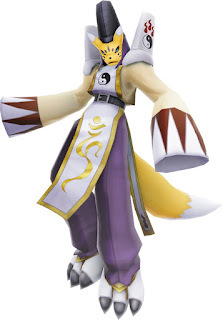 Taomon picked up on the interfering will of someone distorting the principles of this world. Wandering the digital world, the protagonist is attacked by Mugendramon. By a hair's breadth they somehow get out of harm's way, meet Jijimon, and witness the disastrous state the Village of Beginnings has been put in by Mugendramon's frequent raids.